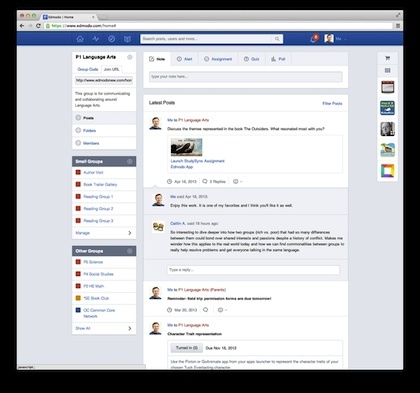 Social learning platform Edmodo has received a facelift. The K-12 platform sports a simpler interface, according to the company, which announced enhancements during a free virtual conference it held this week. At the same event, Edmodo also demoed an update to its iPad app to reflect the new changes on the Web version of the application for more cross-platform consistency. Edmodo is a free learning management environment that allows teachers and students to communicate online. The redesign of the interface includes changes for more accessibility and usability. For example, icons in the library are larger and easier to read. Also, the user interface now has two columns instead of three. A floating toolbar for apps allows users to drag any app from the program's app launcher and drop it into the toolbar; from there the users can access the apps from anywhere within the application. Users can also manage apps from anywhere within Edmodo, including installing, deleting, and transferring licenses between groups with a single click. Edmodo's interface has been redesigned to improve accessibility and usability. Group pages--collections of people--now allow for simpler management of small groups (subsets of those people), posts, folders, and group members. The company has also made its free apps available to international users. The new release of the iPad app for Edmodo, version 4.1 lets the teacher perform all classroom management from the device, including creating new accounts. Another new feature enables shuttling of files such as files, photos, and videos from other apps into Edmodo. For example, a user could create a file in an iPad app, such as mobileword processor Pages, follow the steps to open the file in another app (Edmodo), and attach the file to a post, assignment, or library. An Edmodo file could also be exported elsewhere via the same functionality. The new version of the app is 30.3 MB in size and requires iOS 6.0 or later. Edmodo is in use by teachers at Lakeview High School in Michigan, Hilton Head Island Elementary School in South Carolina, and Bryan Independent School District in Texas.